(NaturalNews) Food allergies have become a global epidemic and conventional medicine has no cure. In fact, according to the Centers for Disease Control, food allergies (in kids) have increased by 50% between 1997 and 2011. Could this have anything to do with genetically engineered foods? GM foods cause massive damage to the digestive system. On the next NaturalNews Talk Hour, Jonathan Landsman and Robyn O'brien - a former food industry analyst, mother of four children and food activist - reveal the true dangers within our food supply causing leaky gut syndrome, compromised immunity and the dramatic increase in cancer rates - worldwide. We all know that a 'leaky gut' is defined as the development of gaps between the cells that make up the inner lining of our intestinal tract. As the intestines breakdown, they allow unwanted (foreign) substances to enter our bloodstream. Simply put - if you suffer from leaky gut - undigested food, bacteria and metabolic waste products pollute the entire body causing inflammation, food-related allergies plus many other chronic degenerative diseases. The digestive system is responsible for maintaining about 80% of our natural immunity. How could any physician, in their right mind, not understand that toxic food creates a toxic body - which, in turn, produces symptoms such as food allergies, skin rashes, brain fog, fatigue - the list goes on and on. On the next NaturalNews Talk Hour, every doctor needs to tune in and discover the real reason why GMOs are literally destroying modern society. A study published in the Food & Chemical Toxicology Journal, led by Gilles-Eric Seralini of the University of Caen, clearly states that eating genetically modified corn caused rats to develop horrifying tumors, widespread organ damage, and premature death. To make matters even more shocking - this is the only long-term study examining the health risks associated with eating GM foods. But that won't stop greedy corporations, like Monsanto, from pushing their agenda of owning the entire food supply through patent-protected, GM seeds. Up to 50% of males and 70% of females rats suffered premature death. Rats that drank trace amounts of Monsanto's herbicide Roundup Ready had a 200% - 300% increase in large tumors. 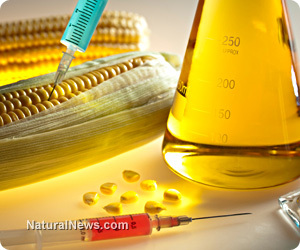 Rats fed GMO corn and traces of Roundup Ready suffered severe organ damage - including liver damage and kidney damage. This study fed rats NK603, the Monsanto variety of GMO corn that's grown across North America and widely fed to animals and humans. Keep in mind, this is the same type of corn found in corn-based breakfast cereals, corn tortillas and corn snack chips. On the next NaturalNews Talk Hour - you will be shocked at what the mainstream media is not telling you about the true cause of allergies and disease. Join us! Robyn O'Brien is an author, public speaker, strategist and mother of four. She brings insight and detailed analysis to her research on the health of the American food system as documented in her first book, The Unhealthy Truth, and has been called "food's Erin Brockovich" by the New York Times. Her work has appeared on CNN, the Today Show, Good Morning America, FOX News, in the Washington Post and countless media outlets, and she currently writes a popular column for Prevention - while serving as the Executive Director of the AllergyKids Foundation and doing strategic advisory work for companies making trend-setting changes in the food industry. Stop allergies forever. Beyond the GMO issues, concerned parents will not want to miss a word of what Robyn says about the hidden dangers within our food supply. Contrary to popular belief, government health agencies operate solely in the best interests of major corporations without regard to human health concerns. Join us for an informative and empowering program.